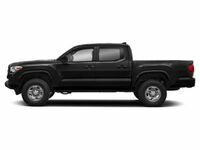 Powerful, efficient, affordable and versatile, the Toyota Tacoma midsize pickup truck is the perfect combination of capability and athleticism in the Toyota model lineup. With the debut of the 2018 Toyota Tacoma near Bangor, ME, car shoppers will be greeted by a revamped style and improved safety. Expected to be available at Downeast Toyota this fall, the 2018 Toyota Tacoma is a welcome addition to the dealership showroom! When the 2018 Toyota Tacoma arrives, drivers will discover a bold style that is highlighted by an updated grille. 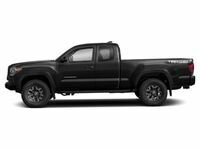 Tacoma SR and Tacoma SR5 models will feature a revamped grille, while Tacoma TRD Sport and TRD Off-Road trims add a dark mesh grille and the top-of-the-line Tacoma Limited adds a Satin Chrome grille to pair with premium black leather interior. With the addition of standard Toyota Safety Sense technology, the Tacoma will upgrade safety with a Pre-Collision System with Pedestrian Detection, Lane Departure Alert with a Sway Warning System, Automatic High Beams and Dynamic Radar Cruise Control. Drivers in search of a capable and fuel-efficient pickup truck will find that the 2018 Toyota Tacoma near Bangor, ME checks all the boxes. A high-strength steel frame and high-strength steel body make the rugged Toyota Tacoma stand out from the automotive crowd and with a dynamic suspension, the Toyota pickup truck is right at home on the highway, jobsite or trail. Under the hood, the 2018 Toyota Tacoma features a standard 159-horsepower 2.7-liter four-cylinder power core that can be married to a six-speed manual transmission or a six-speed automatic transmission -- the previous five-speed manual is no longer available. Rear-wheel drive entries paired with the automatic transmission will make 19 mpg in the city and 23 mpg on the highway. If you need more power, the 278-horsepower 3.5-liter V-6 with Toyota D-4S fuel injection will deliver on all counts. Paired with the six-speed automatic gearbox, the 3.5-liter Tacoma delivers an impressive 19 mpg in the city and 24 mpg on the highway. When you opt for the 4WDemand part-time 4WD system, the Tacoma will still achieve 18 mpg in the city and 23 mpg on the highway. Armed with the V6 Tow Package, the Tacoma will tow up to 6,800 pounds. Inside the 2018 Toyota Tacoma cabin, you will have an elite level of technology at your disposal. A standard 6.1-inch Toyota Entune touchscreen display serves as the focal point of a spacious cabin and is accompanied by a standard rearview camera, Bluetooth technology and Siri® Eyes Free capabilities. Highlight features that are available for select trim levels include Qi wireless charging, navigation, Toyota Smart Key with push-button start, leather interior, a power moonroof and advanced safety systems.